Four twisted square aluminum tent pegs provide solid holding power in tough terrain. 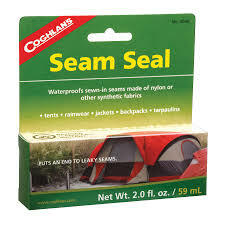 Suitable for larger family style tents, canopies, etc. Made from 6061 aluminum these pegs are difficult to bend and retain their shape. Length: 9″ (23 cm) Weight: 0.85 oz. (25 g). 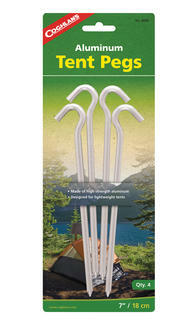 These tent pegs are made from high strength aluminum and are designed for lightweight tents. Features: Four -pack. 7" x x1/4" lightweight tent stakes. Each peg weighs 2.5 oz. 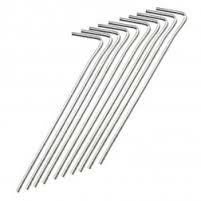 Kiwi Camping Steel Pegs, comes as a pack of 10 pegs, each one 25cm long or 30cm Long. 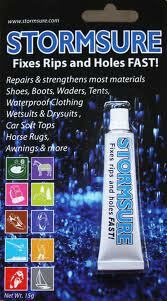 A useful accessory for campers, can be used to provide extra support for your tent.